Affordable and Reliable, we bring the workshop to you! I just wanted to say a massive thank you, especially to Ryan. I honestly did not believe my leather sofa had any chance of survival after my nail polish miss hap, but Ryan is a magician. I am truly amazed at the final result, the colour match is perfect, its like it was never damaged. Not only did he work wonders with my sofa, he managed to keep 2 toddlers, asking a million and one questions entertained in the process. Thank you so much! Sam A. Coventry. *See the before and after pics in our gallery! I didn't think Mobile Furniture Repairs existed till i came across this company!. 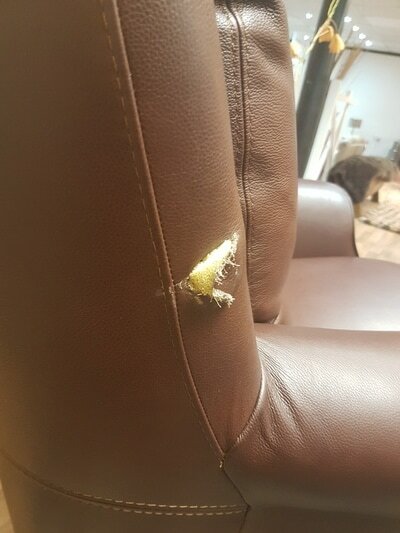 "Just before the Spring Bank Holiday I booked and appointment with Recliner and Furniture Repairs to repair my manual Laz e boy which due to my overzealous cleaner had shed a wheel and developed a fault and would also not recline, an appointment was made for yesterday between 09:00 hrs and Noon. Wow! What great service. On the dot of 09:00 am your engineer arrived. He promptly set to work and effected the repairs required to make the chair fully functional again. I cannot thank you enough." Kind Regards & grateful thanks. David N Peach Coventry. 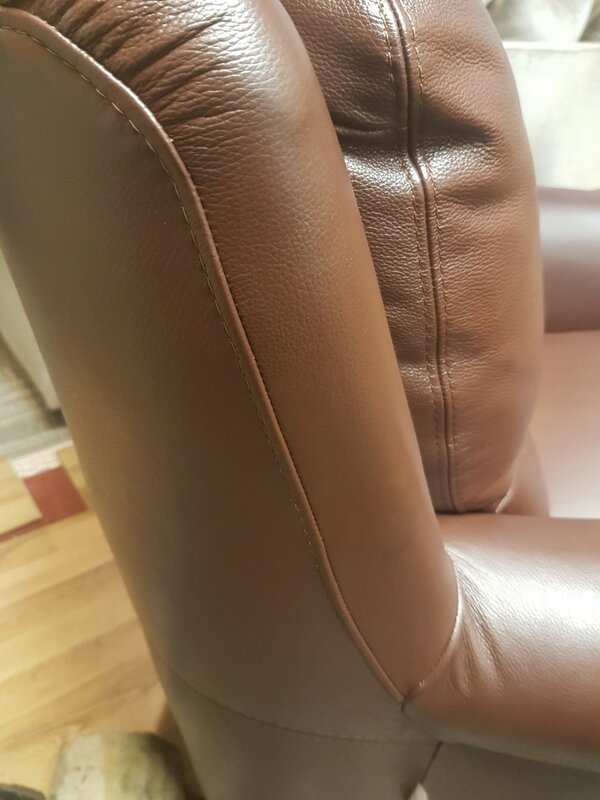 Leather Suite Repair and Restoration. "After trawling round the usual list of no-hopers, I stumbled across your set up. Best discovery I have ever made. I was at the point of seriously considering replacement. You changed all of that. The job done is brilliant and the leather looks as though it came from the same cow (although it would be a very old cow by now) It could not be better. Brilliant. Restores faith in human nature to find someone who can do a proper job without drama or pantomime." "The combination of professional service and expertise was exemplary - the repair to the leather recliner (now like a new chair!) is of an excellent quality, the charge very reasonable and the whole experience of something problematic was totally transformed by the informed reassurance that the chair was repairable, which was borne out by the swift re-delivery. "Service with a smile" was just the icing on the cake!" "Recently had the pleasure of watching a true craftsman at work whilst he restored our leather sofa. Ryan arrived on time on the given date to assess what had to be done and costs involved. He also took the time to explain how he would do the work and what was needed. Ten days later he arrived on time again and completed the work in our own home to a very high standard with no mess what so ever. Cannot recommend highly enough his workmanship and reliability. Really nice guy". 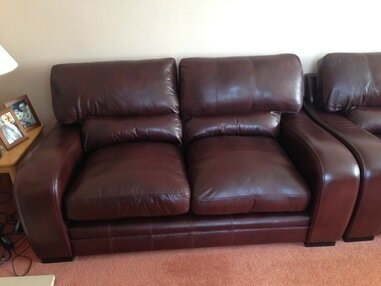 "What fantastic service, Ethan repaired my two leather settee's, no fuss or bother, at home, made a great job of them. Very polite, and friendly, left no mess. Would recommend this company, they actually do a professional job, really very pleased with the outcome." "We just got our six dinning room chairs back .. and WOW they are fantastic, they were in a sorry state, but now they are better than when we brought them. 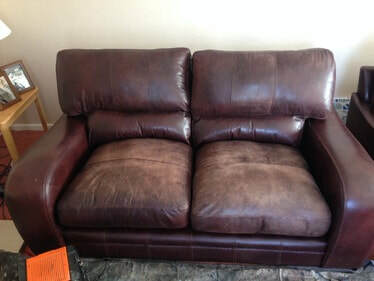 They are so much more comfortable, workmanship excellent, talent excellent, you were very punctual for picking up also bringing them home, I cant thank you enough, and thank you for your tips on looking after the leather ..thank you .."
"We have a 3 str leather recliner, it has electric recliners both ends, unfortunately the webbing has broken on the seat one end. I phoned this company up, they came down promptly, gave me a price to do the repairs. We were very pleased with the quote! So agreed to get it done. Ryan came down exactly on time on the date that suited us, he did a first class repair and would recommend this company to anyone which I shall do." John and Rita. Himley, Nr Dudley. We’re absolutely delighted with the first-rate job you have done repairing our chaise lounge, piano stool and antique wooden chair. The care and attention given, not just to the meticulous repairs, but also to the customer service has been outstanding. We are very grateful for the no-nonsense, professional service". "Expect more work from Bishop’s Tachbrook, as we’ll be spreading the word!" Andrew D. Bishop's Tachbrook Nr Coventry. Follow us on facebook for more pictures and regular info, click here.